The recently-elected Costa Mesa City Council members - Sandy Genis, John Stephens and Allan Mansoor - will be sworn-in at a Special Meeting of the City Council on Tuesday, December 13, 2016, beginning at 5:45 p.m. You can read the full agenda for that meeting HERE. Public Comments will be restricted in this special meeting to items on the agenda only. City Clerk Brenda Green will manage the only item on the agenda, #1, HERE. She will acknowledge the certification of the election by the Registrar of Voters and tell us that the total number of ballots cast in this election was 43,721. Total registered voters in Costa Mesa according to the Registrar of Voters is 54,888, so 79.65% of the voters participated, slightly less than Orange County as a whole. She will announce the names of the three people who secured a seat. According to the staff report, there will be a recognition of outgoing Mayor Steve Mensinger and Councilman Gary Monahan and each will be given the opportunity to speak, although Monahan already did his thing at the last meeting. Green will then administer the oath to the three new council members, which will be followed by the nominations for Mayor and Mayor Pro Tem. Apparently there will also be time for Council members' reports, comments and suggestions, followed by adjournment until the first meeting in January. CITY MANAGER AND 9/80 - A GREAT START! By the way, change is already happening. Tom Hatch announced that he will no longer be known as the CEO of the City - he will be City Manager, the title he should have had for the past almost six years. And, the Miscellaneous Employees will soon return to the 9/80 work schedule they had before Righeimer/Mensinger took over. This is GREAT news for them, and for the city, because it provides us with a competitive recruitment tool. Kudos to Hatch for these moves. The agenda for the Costa Mesa Planning Commission meeting on Monday, December 12, 2016 has been posted, HERE. This meeting begins at 6:00 p.m. in City Council Chambers at City Hall. This will be the 5th consecutive Monday that the Planning Commission will have met, so this abbreviated agenda will probably be welcomed. As we mentioned in an earlier post, all the Sober Living Home issues originally scheduled for this meeting have been removed from the agenda. It's our understanding that no further hearings will be held on Sober Living Home issues until the new City Council conducts an "evaluation" - a term that was not further defined in the memo sent out announcing the fact. There are two items remaining on the agenda for Monday's meeting. 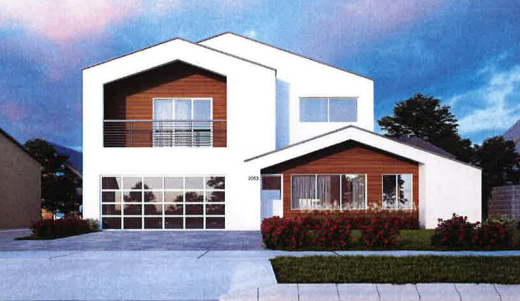 Public Hearing #1, HERE, is a design review and tentative parcel map for a two-unit, two-story small lot development at 2053 Tustin Avenue. 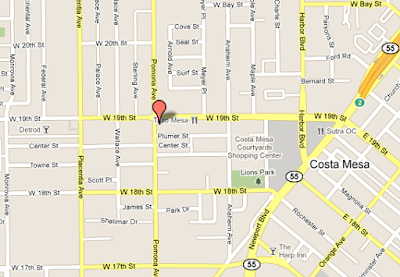 SHARED PARKING AND A MASSAGE PARLOR ON HARBOR BLVD. 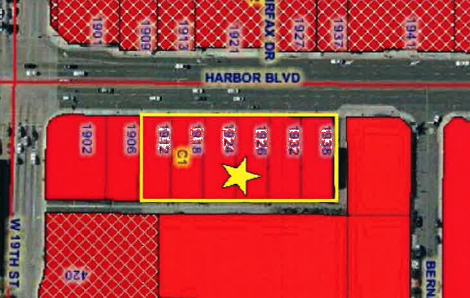 Public Hearing #2, HERE, is a Planning Application for a Conditional Use Permit for shared parking between 1912 through 1942 Harbor Blvd. 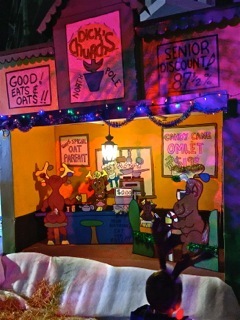 and a minor CUP to deviate from shared parking requirements for a massage establishment. This should be a relatively short meeting, and is expected to be the final one of this calendar year for the Planning Commission. I'm sure they, and the staff, can use the rest. Heads-Up! NO Sober Living Items Will Be Heard Monday! I'm on the distribution list for information coming out of the Planning Department about Sober Living Homes. I just received an advance notice from the good folks at City Hall about the Planning Commission meeting scheduled for Monday, December 12, 2016. The City Council has expressed its intent to evaluate the city's regulations and approach to sober living homes and licensed drug and alcohol treatment facilities in early January 2017. The Planning Commission's review of applications filed pursuant to these regulations will be deferred until the Council has conducted its evaluation. Therefore, the Planning Commission WILL NOT conduct any hearings regarding sober living homes or licensed drug and alcohol treatment facilities on December 12, 2016. You will receive a new notice when the public hearing has been rescheduled for individual applications. We apologize for any inconvenience. 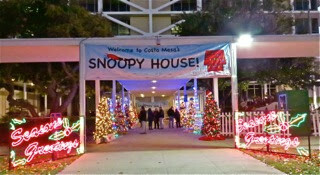 So, all you Sober Living Home fans, you get to stay home Monday night - or go visit the Snoopy House instead. Although the agenda for Monday's meeting has not been released yet, I'm told that there will be two development projects on the agenda, so the commission will meet. More on that when the agenda is released. Well, the counting is over, the Registrar of Voters has certified the election and we know who our new municipal leadership will be. Newcomer John Stephens and returning member Allan Mansoor will join Jim Righeimer, Katrina Foley and re-elected Sandy Genis to form what will certainly be a better-balanced City Council. No longer will major decisions be made by two men - Righeimer and ousted Steve Mensinger, who assumed - correctly - that Gary Monahan would just go along. Now decisions will be made based on what is best for the community, not best for a bunch of special interests. I look forward to those discussions. We don't yet know who will be running the show - nobody has yet been sworn-in and no Mayor nor Mayor Pro Tem elected - but that's going to happen next Tuesday. I'm suspecting neither Righeimer nor Mansoor will be in those roles. So, here are some of my random thoughts about what I would like to see happen downstream, beginning in January. Abandon this CEO nonsense! 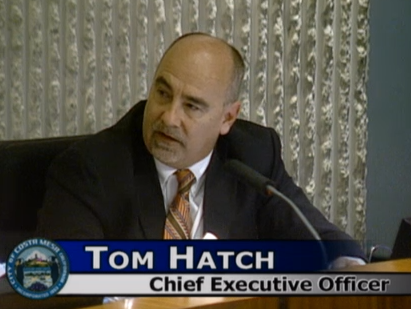 Tom Hatch is our City Manager, period! This bogus experiment of trying to run the city like a business has failed - miserably! This is a CITY, and the only business it's in is to provide safety and services to the community. Begin City Council meetings at 6:00 p.m., not 5:45. This is another hair-brained Steve Mensinger idea that needs to go - NOW! Resume Study Sessions. We need to return to the Study Session format at least once a month, maybe more, so ideas from staff and ALL members of the City Council can be fleshed out in an informal, free-flowing setting. Abandon the requirement that Public Hearings begin immediately at 7:00 p.m.! It makes no sense to be forced to stop other city business just to begin those hearings. Stop trailing Public Comments to the end of the meetings. Begin them early in the meeting and let the speakers address the council until everyone who wishes to has been heard. 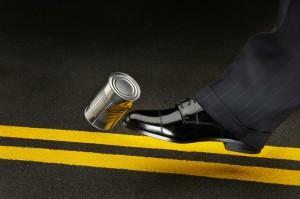 Stop trailing items pulled from the Consent Calendar to the very end of the meeting. This was a bogus scheme implemented so developers wouldn't have to sit around in council chambers. Let them sit. Re-assess what appears on the Consent Calendar. In recent months there have been too many items that should have been part of the agenda. Expect Hatch to have something to say more than, "Nothing tonight, Mr. Mayor." during his time in the agenda. 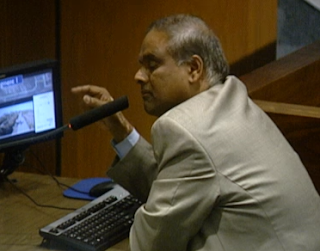 Also, on that note, council members should quit prowling the halls of City Hall, giving direction to staffers. If you have an idea or a problem, tell Hatch unless he otherwise delegates it to someone else. Ease off on the heavy-handed prohibition of expressions of appreciation and/or approval (clapping) by the audience. Stop treating members of the audience like criminals on a perp walk. It smacks of dictatorship. You can't demand respect, but you can command it by your actions. Discuss abandoning the COIN program. It's proven to be non-productive, costly and impractical. Meet in good faith with representatives of the Firefighters Association and resolve contract differences. Discuss the implementation of Chief Stefano's deployment model, utilizing the Rescue Ambulances for most patient transport. Utilize an independent company for overflow/Basic Life Support cases. If the current provider, CARE Ambulance, continues to balk at that change, put it out to bid. There will be someone out there willing to do the work. Re-assess the staffing model for the Police Department. Crime is up and recent laws and the proliferation of Sober Living Homes and Homeless folks in our community leads us to believe it will continue to rise. Ramp-up police hiring to bring the staff to appropriate levels - probably no fewer than 150 sworn officers. Discuss the abandonment of the Small Lot Ordinance which was designed only to make life easier for developers and has placed extraordinary stresses on our single-family neighborhoods. 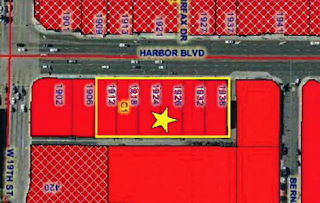 Roll back the Harbor and Newport Boulevard Overlay schemes in the new General Plan. Evaluate the impact of Measure Y - the Smart Growth Initiative - on current and probable projects around the city. Evaluate the impact of Measure AA on the previously approved projects that are currently part of the Fairview Park Master Plan. At a recent Parks and Recreation Commission meeting Commissioner Byron de Arakal suggested the City Attorney perform that analysis. de Arakal also suggested re-constituting the Fairview Park Citizens Advisory Committee, which had been placed in suspended animation pending the completion of the General Plan, to have that body do an analysis of Measure AA impacts on Fairview Park projects. That idea should be abandoned and that dormant committee should be thanked for their efforts and disbanded. Measure AA has resolved those issues. Disband the Senior Commission with our heartfelt thanks for their efforts. That group has proven to be unnecessary. We have an excellent City Staff running the Senior Center now. Create an Airport Advisory Committee to stay abreast of John Wayne Airport issues and report back to the City Council. We have ignored that very important issue and all signs lately are that the Eastside will soon feel an even greater impact. We, the City, needs a seat at that table. Consider disbanding the Pension Oversight Committee. This committee has accomplished very little. Either give them direction or thank them for their service. Without state intervention, the only solution to our pension issue is municipal bankruptcy. Whatever assignments they might have had in the future can be handled by the Finance Advisory Committee, if necessary. Discuss the performance of our contract legal department. When that contract was bid it was presumed that the winning bidder would be able to provide the full range of legal needs, including litigation. This has proven not to be the case. 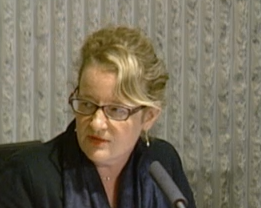 Establish a council sub-committee of Katrina Foley and John Stephens to lead an analysis of Jones & Mayer's performance and advise the full council. Discuss exactly how Measure EE will be implemented now that we have a new council seated. How will district conflicts be resolved? What is the process to fully implement this new law? Ramp-up recruitment efforts for Public Services. Our city is NOT well served in the long run by hiring contractors to fill the holes in that organization. We have a dozen openings now that need to be filled. Revisit the CMCEA contract. It is non-competitive and is a disincentive for employees, creating a revolving door. OK, that's about it for now. There will be much more to be addressed as we move forward. I'm sure most of you will have other items to add to the list, but that's my first pass. I'm looking forward to watching all five of our council members working collaboratively together. My fingers will be tightly-crossed in anticipation of real progress being made. 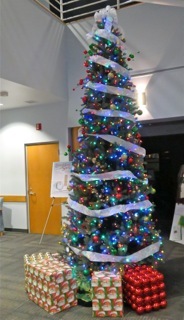 Last night I attended the Costa Mesa Bikeway & Walkability Committee meeting - my first in many months - and found the Senior Center lobby in full Christmas mode. I saw a few new faces but the same focused attention to business as I've observed in the past. Most of the members attended - Ralph Taboarda, Cynthia McDonald, Russell Baldwin, Cindy Brenneman, Leah Ersoylu, Maggie Gallagher, Rick Huffman, Jim Kane, Jim Kerins, Andrea Marr, Flo Martin, John Merrill and Chamber of Commerce Liaison Brent Stoll were in the room, with only Jim Erickson, Brian Valles and Newport Mesa Unified School District Liaison Dr. Kirk Bauermeister absent. 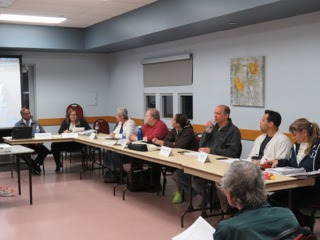 Council Liaison Katrina Foley attended this meeting, too, and provided some momentum to the process. 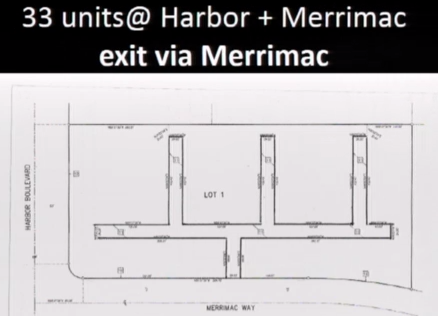 During member comments Flo Martin presented a slide show depicting what she described as a dangerous situation on Merrimac Way - the same presentation she made at the recent City Council meeting. 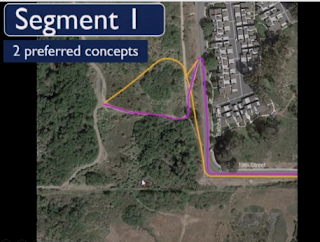 The combination of pending major construction, narrowed roadways and lack of sidewalk space is, as she put it, "An Accident Waiting To Happen" - she used a slide for emphasis. Member Russell Baldwin affirmed her opinion. Cindy Brenneman opined that fallen pine needles from the recent wind event are making many of the existing bike paths treacherous. Jim Kerins, who arrived late, inquired about the status of the 19th Street Bike Trail project, since it was the subject of discussion at the recent council meeting. 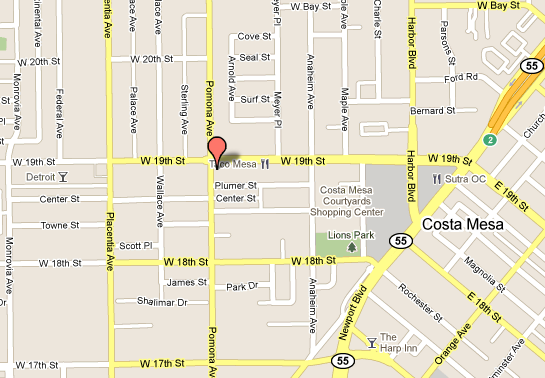 Maggie Gallagher observed that the lights are STILL not working along the new Harbor Blvd. bike path. Jim Kane also chimed in on the Merrimac Way situation and asked for an update on the 19th Street Bike Trail. He also wondered about the crossing on Placentia at Fairview Park - work seems to have stopped. Acting Public Services Director Raja Sethruaman explained that there had been a delay. Later he said something about the contractor defaulting and the bonding company was now involved and a new contractor will soon finish the project. 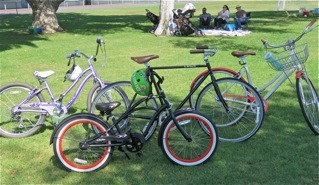 Kane also spoke briefly about a Sustainability Seminar and will provide handouts and business cards dealing with bike racks. He was also concerned about the condition of the pavement on the Harbor Cornerstone Trail. 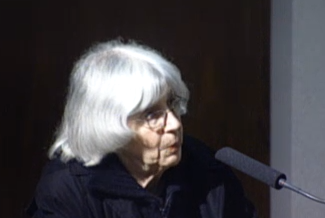 Foley opined that perhaps the contractor could repair it under a warranty. Chairman Ralph Taboada told the group that Copenhagen recently passed a law that 50% of the communters must do so by bicycle. 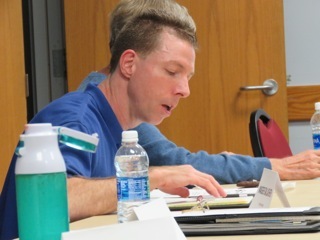 He then addressed the council meeting discussion of the 19th Street Bike Trail, citing that he left the meeting angry because he was forbidden to address the issue as a commentor because he got his card in late. He had wanted to set the record straight that their committee had NOT discussed the environmental portion of the planned trail. Sethruaman had been charged with contacting the relevant agencies to determine whether our current plan is satisfactory before spending any more money on it. That has not yet happened. Rick Huffman complained that they didn't have enough notice on that item because it was a Consent Calendar item - something that might not be discussed at all. Sethuraman gave a history of that project, observing it went way, way back - perhaps as far back as 2005. 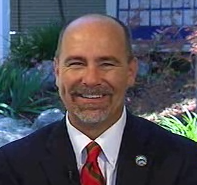 He said that Federal grants are involved and that Cal Trans, US Fish and Wildlife and other agencies are also involved. 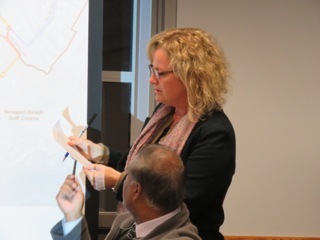 The discussion went on and on and on and it was left that Sethuraman will be addressing the issues with "resource agencies" and report back to the council before proceeding, even though the council approved this part of the project. They approved the minutes of the prior meeting then went about the lengthy process of trying to prioritize their projects. Foley played an active role in this process and, in fact, good progress was made toward winnowing down their long list if potential projects with an eye toward obtaining budget funding for the most important. They defined specific areas where individual projects contribute to a larger plan. It was an interesting process to watch because this group continues to be tightly focused and collaborative. 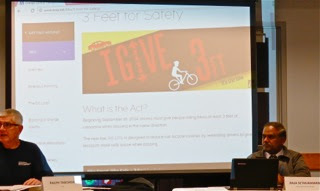 In future meetings members may hear solutions on how to make the public more aware of the need to provide bicyclers 3 feet clearance - state law requires it. 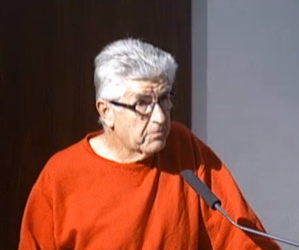 In the meantime, Foley suggested Public Information Officer Tony Dodero should write something for public consumption on the issue that could be "blasted" out to the school district. 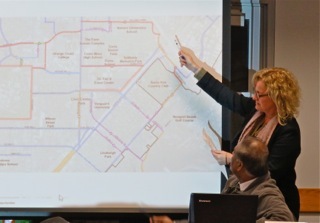 Regarding the cost to produce a completed Bike Map for the General Plan, Sethuraman indicated the latest bid they received was $50,000, and that he's going to ask for more bids, since that number seems high. The committee was advised, in response to a question, that the Arlington Drive Project MUST be completed by June, and that it's well underway. There will be no meeting in January due to the holiday closure of City Hall and the fact that their meeting would have been scheduled on January 3rd, with insufficient time for any kind of staff preparation. It is presumed the next meeting will be the first week of February. The meeting adjourned shortly after 8:30. A side note: it was mentioned again that there are about a dozen vacancies in the staff ranks in the Public Services organization. This shortage cannot help but create slowdowns throughout the management of projects. Human Resources is working hard to fill those slots and contractors are being used in the meantime. So, I'm glad I was among the four attendees at this meeting. I missed watching them work and appreciate the progress they've been making and am looking forward to more good works next year. Kudos to all. 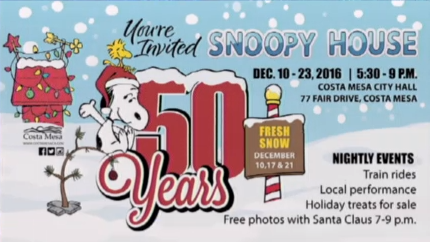 One of my very favorite Costa Mesa events begins this Saturday, December 10th, on the front lawn of City Hall starting at 5:30 p.m. Yep, it's Snoopy House time again! 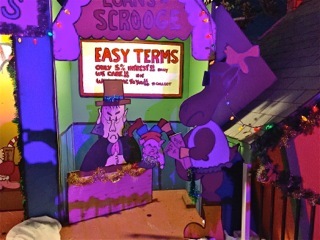 This great event runs through December 23rd. 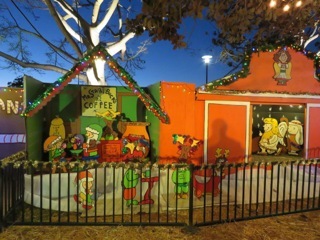 This is a very special event and brings families together at City Hall in droves as they view the fantastic displays created by the Jordan family at their home on Tustin Avenue for decades. 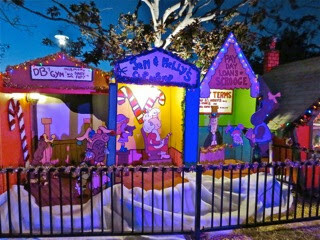 Meet Santa, get free photos taken with that jolly old elf, sip free apple cider and have a wonderful time. 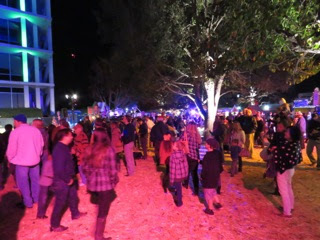 Read all about it HERE, on the Costa Mesa Connected page. See you Saturday night. I'm excited! 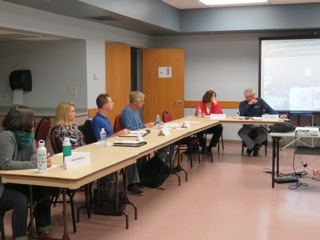 The Costa Mesa Bikeway and Walkability Committee meets again tonight at 6:30 at the Costa Mesa Senior Center, 695 West 19th Street for their final meeting for a couple months. You can read that agenda HERE. Tonight among the issues to be discussed will be prioritization of the Bicycle Master Plan Projects and new Bicycle Racks. If you have an interest in bicycles in our city and efforts being made to make it more bike/walk friendly, stop in at the Senior Center and listen to this good group work. There's an opportunity for public comments in the beginning, so bring your thoughts/opinions and share them. 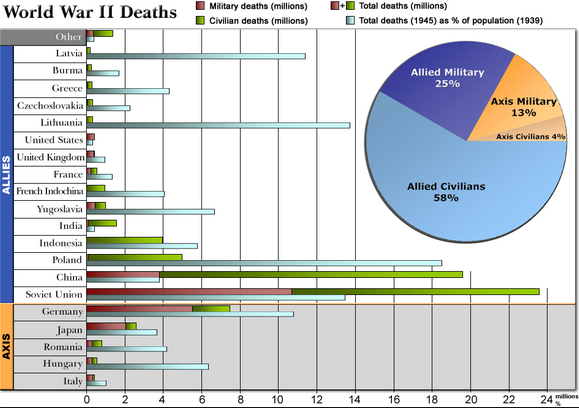 TODAY IS THE 75TH ANNIVERSARY OF THE ATTACK ON PEARL HARBOR BY THE EMPIRE OF JAPAN. WE MUST NEVER FORGET! 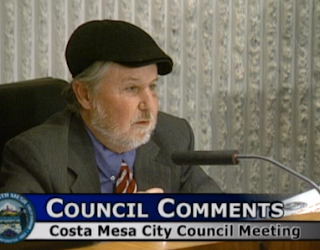 The Costa Mesa City Council met last night for what will likely be the final time for the current council to all sit on the dais together, and even then they didn't get a full house. When the meeting began Mayor Steve Mensinger and lame duck councilman Gary Monahan were not present, so Mayor Pro Tem Jim Righeimer conducted the meeting. Monahan showed up about 35 minutes later - Mensinger never did show up, so we may have seen the last of him since there's no reason for him to appear next Tuesday at the Special Meeting when the new council is sworn-in. As previously announced, the planned presentation to Jim Jordan was pulled from the agenda. Jordan wrote to me later last night to say that business issues kept him from attending, but that he would be at the kickoff for the Snoopy House celebration on Saturday, December 10th, beginning at 5:30 p.m.
Public Comments was interesting. Beth Refakes inquired about the status of the planned Council Chambers renovation project, citing recent technical glitches. 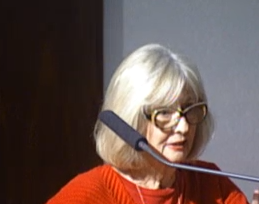 She also asked that the city involve itself in the current concerns with John Wayne Airport - plans are for all air traffic in the Los Angeles Basin to be tweaked by the FAA, and it might place more air traffic over Eastside Costa Mesa. 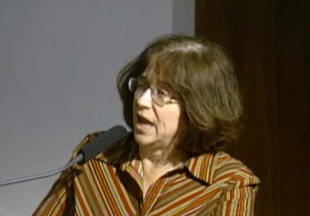 Tamar Goldmann complained about high density housing and the parking pressures it places on nearby neighborhoods. 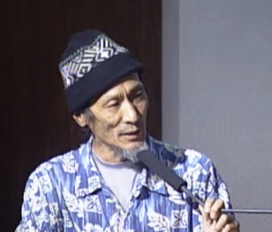 Ralph Taboada reported on his attendance at the recent ACC-OC Sober Living Home Town Hall, indicating the officials there said not much could be done. He also praised Jeff Arthur, Chair if the Pension Oversight Committee who passed away last Saturday after a long and very debilitating illness. 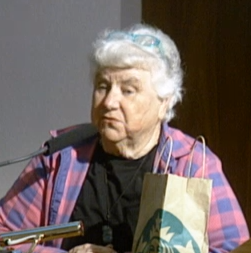 Dorothy McNiff complained about the impact the Beach Pit BBQ restaurant has on her Eastside home since it lost the shared parking on which the operating permit was based. She wondered about some kind of collusion. Robin Leffler also praised Jeff Arthur, describing him as a fine and decent man. 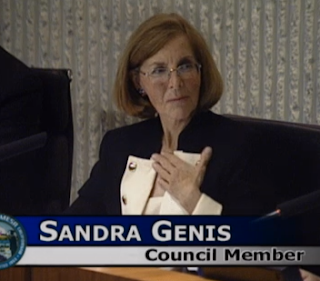 She then praised Monahan as "one of the best mayors", citing that he "really knew how to run a meeting." Steve Chan played a video clip from a recent Planning Commission meeting, then asked the City Attorney to investigate the State sound laws so it can be discussed when the Holiday Nightclub is discussed in January. 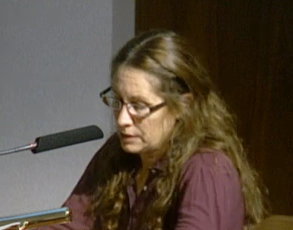 Mary Spadoni praised Costa Mesa residents for their responsiveness to the plea for materials for the folks at Standing Rock. She said clothes, large pots and pans, tables and chairs and more are needed to get the demonstrators through the winter months. She also announced the homemade dog biscuits - $10 per jar, with all profits going to the Standing Rock folks. 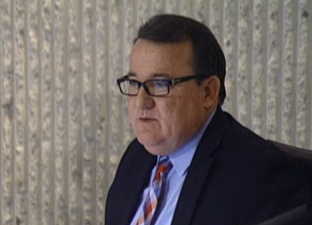 Reggie Mundakis advised the council that the OC Fairgrounds still owes the Orange County Sheriff's Department over $129,000 for the Trump Rally earlier this year. 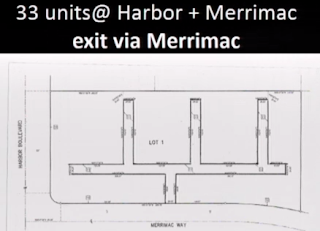 Flo Martin showed a presentation of Merrimac Way, citing the plan for a new housing development to be entered and exited off Merrimac. 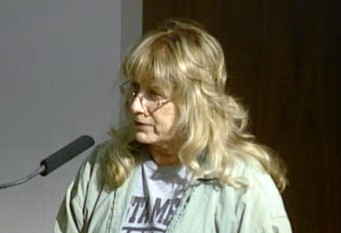 She showed the lack of sidewalks and the danger to bicyclists. Terry Koken observed that Mensinger was absent and took some of the credit for his defeat. 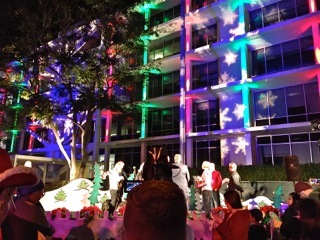 He then closed with another of his trademarked ditties. 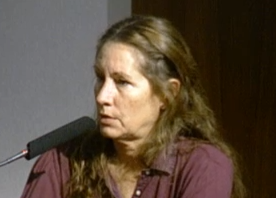 Cindy Black advised that there is a California Coastal Commission meeting in Ventura at which new drilling on Banning Ranch will be discussed and suggested staffers attend. She reminded us there will be 100 wells on the ranch. 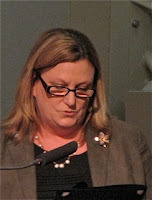 During Councilmember Comments Katrina Foley addressed many issues. She spoke about the success of the recent Home Tour and advised the next one will be held on December 7, 2017 and will also include Heroes Hall again. She told us she recently met with new Santa Ana councilman Jose Solorio, who discussed mutual interests between our cities, among them homelessness. 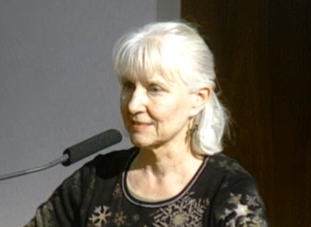 Regarding John Wayne Airport, she observed that the "working group" apparently has gone by the wayside and encouraged staff to get involved. 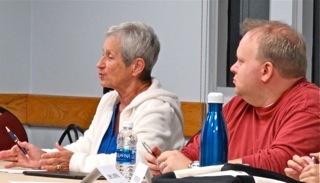 She spoke of the Sober Living Town Hall and advised that cities and the state need to get on the same page on this issue, and that she'd like a briefing on pending legislation. She also praised Arthur, then asked about the reinstatement of the Circle of Service. Sandra Genis attended an Economic Summit recently and observed that lots of jobs will likely be lost to automation. She also told us that, while she had not attended the Sober Living Town Hall, she had attended a similar meeting with many of the same attendees. She also suggested we find a way to work together with "that party that seems to get things done in Sacramento." 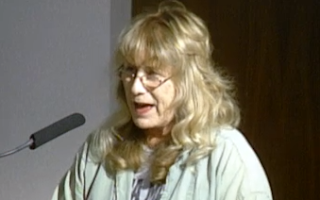 She also spoke of the Ventura Coastal Commission meeting, citing that if you attend and don't wish to speak you may be permitted to donate your time to another speaker. She observed about the 75th Anniversary of the Pearl Harbor attack today. 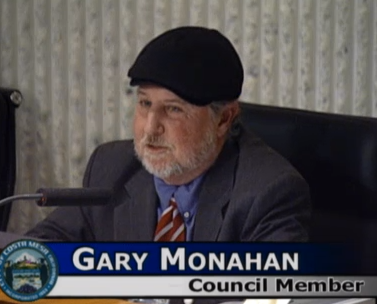 Gary Monahan said more than he has in a year. He thanked Robin Leffler for her praise. 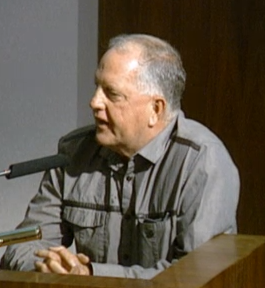 He said he didn't attend the Sober Living Home Town Hall, but he does know John Moorlach and Dana Rohrabacher... what? So, what? He also expressed great displeasure at the fact that the attorney for all the applicants before the Planning Commission Monday failed to show up causing all items to be continued. 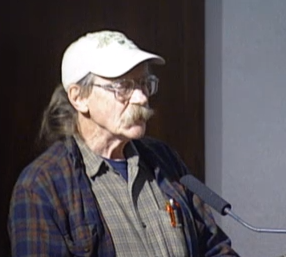 He said we are trying to do everything we can do, and gave a hat tip to the Planning Commissioners for their efforts. On the subject of Homelessness, he told us he is collecting goods for Costa Mesa homeless, so folks can drop things off at his pub and he will get them to the homeless. 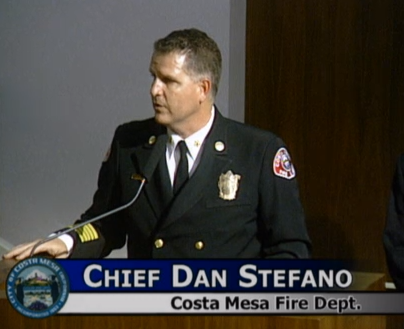 Then he said, "You've heard we need more police and fire, yada, yada, yada", then launched into praise for Police Chief Rob Sharpnack and Fire Chief Dan Stefano, indicating they're providing great leadership. CEO Tom Hatch actually had a few things to say at this meeting. He told us he will follow up on the issues raised by speakers and councilmembers. He also praised Arthur. He said the staff is working on a report regarding the airport and will finalize that and get it to the council shortly. 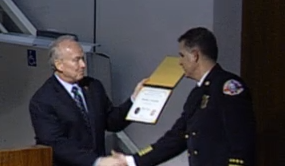 He then announced that Interim State Fire Marshall Mike Ridgewine was in the room to make a presentation of a "Fire Chief Certificate" to our Fire Chief, Dan Stefano. According to Ridgewine, Stefano is the most recent member of Fire Service Management to go through the rigorous process and is the 32nd person state-wide to receive this certificate. Stefano made an excellent acceptance speech in which he praised the City management team and their support for his organization. He told us that on January 2nd we will take delivery of two new fire engines and that they will be hiring eight (8) new firefighters next year. He received a standing ovation when he finished - correctly so. Items 5,6,13 and 14 were pulled from the Consent Calendar for later discussion. Promptly at 7:00 Old Business #1 - the only item on the agenda - was heard. This was the second reading of ordinances applying new State Building Codes. It took all of 3 minutes for the council to hear and approve this item on a 4-0 vote. The council then heard the previously-pulled Consent Calendar items. #5 - emergency hiring of professional staff - was pulled by Leffler, who opined that we should accelerate our efforts to fill existing city employees for these jobs. The council passed the item, 4-0. Item #6, was the issue involving the construction of the new Fire Station #6. Beth Refakes pulled this one to inquire about the funding, and opined that it shouldn't come from previously-approved projects - like the Council Chambers renovation. Righeimer told her it was coming from a budgeted amount and the remainder would be borrowed. They passed it, 4-0. Item #13, was the Mesa Verde Medians. Leffler pulled this one to advise the council that most of the attendees at the community meeting on this subject didn't care for the current plan. She also observed that the noticing was insufficient for that meeting. After a very brief discussion the council passed it, 3-1, with Genis voting NO. Then, at 7:15, came #14, the Cooperative Agreement for the Bicycle Corridor Improvement Program - the West 19th Street Bicycle Trail, HERE. This one took a surprising 40 minutes to flesh out. Several speakers addressed this issue. 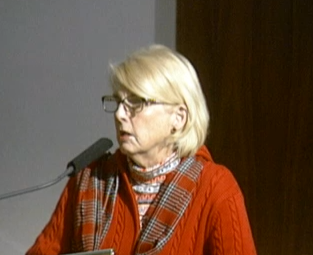 Wendy Leece was concerned about the proximity to Newport Beach and wondered if the Bicycle Committee had discussed this issue. Jay Humphrey observed that the people have spoken via the recent election and was concerned about the hard paving planned. 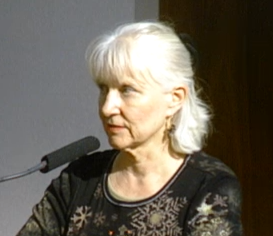 Cindy Black observed that the planned route will impact protected species. Kevin Nelson cited the specialness of this place and it's relationship to the corridor of wilderness along the Santa Ana River Trail. 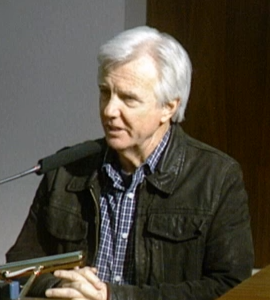 Steve Ray, a member of the Banning Ranch Conservancy, observed that they will soon own Banning Ranch and offered to be of assistance to the city as they plan this infrastructure change. 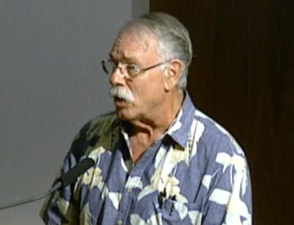 He observed that the Coastal Commission will be involved in this plan. Foley wondered if there might be a way to split the project up and proceed only with the segment involving 19th Street until other agencies have signed in on the remainder. 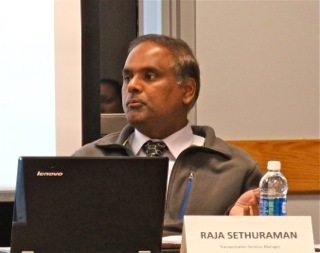 Interim Public Services Director Raja Sethuraman advised her that the grant involved is for the single, large project. She was concerned about how we will manage this project since Sethuraman has 12 or 13 vacancies in his department right now. Monahan asked a similar question... and was given the same answer. Genis observed the unlikelihood of being able to build this project in 2017 because of the bureaucracy and approvals involved, including the Coastal Commission. She suggested that Sethuraman call the resource agency involved first thing in the morning to see where we stand, and not spend another penny until those approvals are received. Righeimer suggested that he didn't really want to walk away from $1.7 million in grant money, but that he agreed with Genis. In the end the commission approved the project with the caveat that Sethuraman make the appropriate contacts before proceeding. It passed, 4-0. Then, before the City Attorney could provide a report - he didn't have one - Monahan said his goodbye's. He said it's been a long 20 years, then proceeded to thank former staffers and every staff member in the room for their help. He closed with a tearfilled "God Bless You All." 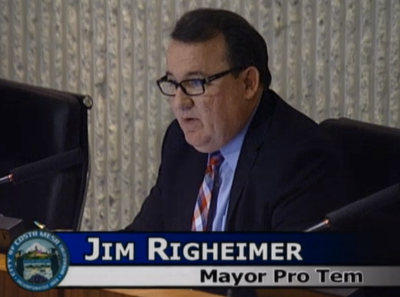 Righeimer closed the meeting at 7:55 in memory of Jeff Arthur with a tear in his eye.